The Adler Planetarium is a memorable and elegant wedding venue located in downtown Chicago's Museum Campus. It is next to Lake Michigan and offers beautiful outdoor and indoor event rental options. The North Terrace and Sundial Plaza are a perfect for an outdoor wedding ceremony or cocktail hour complete with breathtaking views of the Chicago skyline. Inside the Adler your wedding guests can roam the Clark Family Welcome Gallery with its futuristic architecture and fun colored lighting. The premier indoor event space at the Adler is Cafe Galileo's which has floor to ceiling windows and is perfectly sized for a large seated wedding reception. A Fotio Photo Booth setup in Cafe Galileo's at Adler Planetarium. Fun photo booth picture at the Adler Planetarium! The beautiful windows and event decor for an Adler Planetarium wedding. 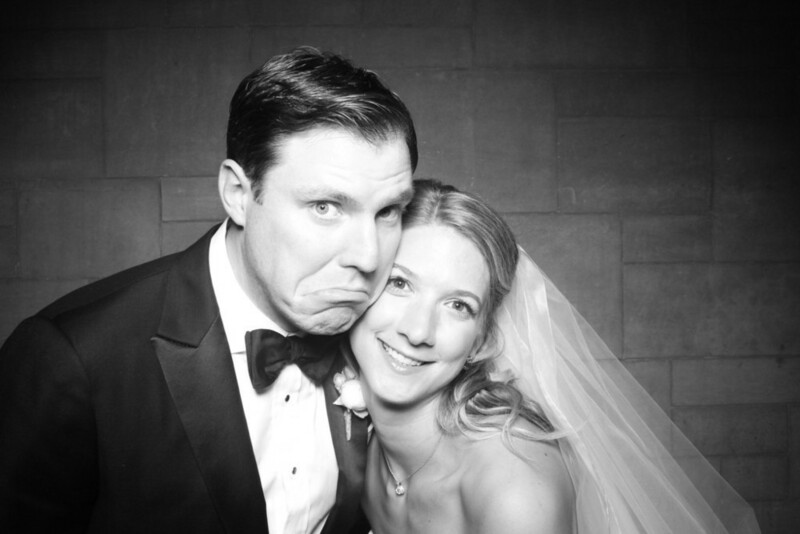 The bride and groom take a photo booth picture at the Adler Planetarium! Atmosphere Events Group did an amazing job with the decor at the Adler Planetarium! Our open air styled vintage photo booth fit in perfectly. Wedding attendees pose for pictures against the stone wall.